In my other blog I try to address the life and times of the last 6,000 generations but trying to look forward to the next 6,000 is a fascinating thought experiment. I was looking at the history of glacials and interglacials and just thinking that it was was terribly “unfair” that while I could imagine the future to my mind’s content, I could never know it. At least for even the distant past, we can look at surviving clues and by the logic that the past must have led to the present we can fill in the gaps and imagine what must have happened. The present constrains the past and helps to keep the imagination within narrow bounds. But for the future, the present provides a starting point and natural laws must also constrain any development of an unfolding future. But there are more natural laws we don’t know about than we do. And we haven’t a clue about all that we don’t know that we don’t know. But I am still free to imagine what the next 100,000 years may bring. 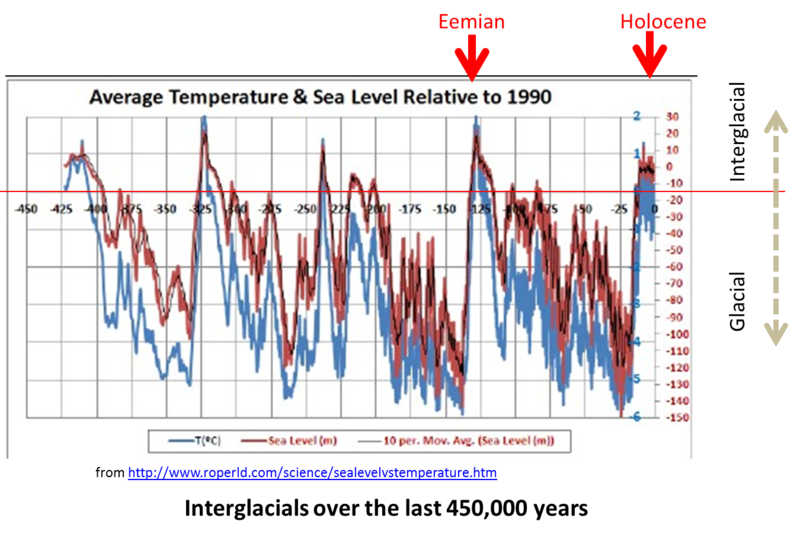 As best we can judge, interglacials (defined as being when temperatures are higher than or equal to those at present) have lasted upto 28,000 years and some seem to have been as short as 4,000 years. However most seem to last around 13,000 years. This interglacial period will surely end – whether within a 1000 years or in 10,000 – and a new glacial period will ensue. But the next glacial will be different for humans and primarily because we have access to “abundant energy” (mainly based on fossil fuels and nuclear energy).